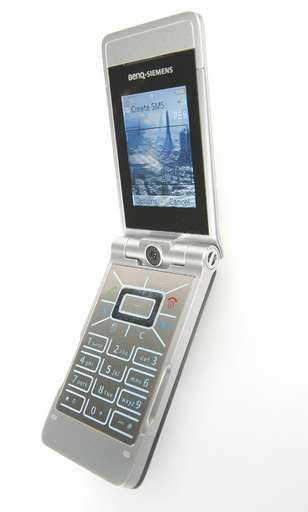 BenQ and Siemens have plumped for a design that mimics the looks of the highly popular Motorola Razr phones. The clamshell does look good, but doesn't work that well as a camera phone. When you open the phone the camera looks directly at you and if you want to photograph someone else you need to use the phone closed. This means that your viewfinder is the small, postage stampsized display on the top of the phone - not quite the same as the Nokia N73 or Sony Ericsson K800i. Furthermore, the EF81 doesn't come with a flash and the options for altering the settings are limited. You can adjust the white balance, but you can't alter the exposure settings and there's no zoom facility, either. This lack of features meant that the pictures we took with it weren't as good as either the N73 or the K800i. They're fine if all you want are snaps, even though the resolution is an impressive 1,600 x 1,200. The camera uses a standard USB cable to transfer images to your PC. Unfortunately, the software that the EF81 uses to make this connection was rather flaky. It took us a number of attempts to even get the program to recognise the phone. We then had to copy images over one at a time, because the program crashed when we tried to move multiple shots in one go. If all you really want to do is take the occasional snap, then the EF81 is perfectly acceptable. However, if you want a phone that can take half-decent pictures then this model isn't the one for you. It's rather a case of style over substance, unfortunately.